Thanks to a leak from a Weibo website user in China, the official announcement date for the rumored OPP R11 and R11 Plus is going to be on June 10. The user released an unconfirmed promotional poster for the R11 variant with date launch date alongside it as seen above. 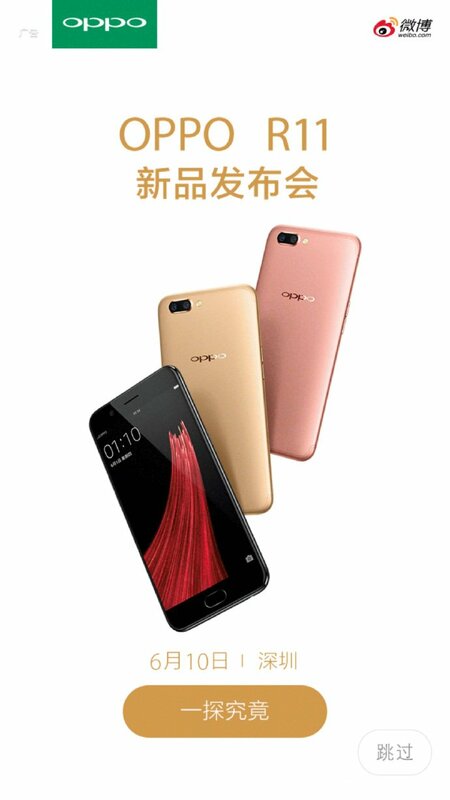 A couple of days ago, these OPPO R11 and R11 Plus were spotted being listed on TENNA website after certification. TENAA is like FCC in the US or NTC in the Philippines where its gives clearance to upcoming phones when they are approved for consumer release. And most phones being spotted on the website before official announcement all ended up being released to the public. So these R11 and R11 Plus devices are most likely to be real devices too, just waiting to officially see the sun light. What is so special about these yet to be announced phones from OPPO? Aside from being selfie centric still, rumors and leaks suggest that instead of having dual camera setup on the front panel, these will have two rear cameras. Further rumors claim that the two shooters will have 20MP and 16MP configurations with 2X Optical Zoom function, while the selfie camera sporting 20MP. On the TENAA listing, it says the phones will be powered by the latest Snapdragon 660 processors with 64GB storage capacity. The only differences of the two would be the RAM (4GB or 6GB), display size (5.5" or 6.0"), and battery (2900mAh or 3880mAh). June 10 is just a little two weeks away from now. So stay tuned.